Embodied Agent is a computer-generated virtual character that has a virtual 3-dimensional body and displays human-like behaviour while interacting with its environment. The term embodied differentiates these agents from regular software agents. Embodied Agent may have the ability to speak, however he is not able to perform a spoken exchange of utterances with a human user. When an Embodied Agent is equipped with conversational skills, he is called Embodied Conversational Agent, which is a synonym for chatbot. One of typical examples of an Embodied Agent is, shown on the video, a virtual commentator reporting vividly a horse race. Another example of Embodied Agents, called DesktopMates by their creator Microsoft, are animated human-like characters that live on computer desktops as a personal interactive companion, and as an assistant capable of speech and completing tasks, as presented on the video below. Embodied Agents appear as well on a computer screen in productivity applications. 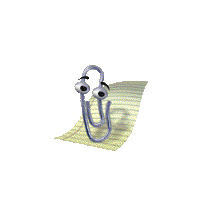 A well-known paperclip Clippy, officially named Clippit, is an example of an Embodied Agent present in the Microsoft Word application. Most people were appalled by little Clippy. We believe that this was not due to Clippy’s intentions, or the cute animated design of Clippy and its siblings, but his inability to deliver on his promise: to actually assist people with PC troubles. Instead, you had to close Clippy all the time, so it gave visitors a negative experience. We believe these kind of desktop mates were introduced far too early. The second decade of this century will provide much more improved desktop mates. 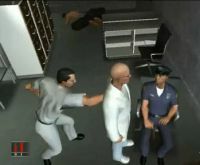 The term Embodied Agent refers also to life-like virtual characters existing in PC computer games such as Half-Life, Hitman: Blood Money, Grand Theft Auto or Crysis. On the picture you can see a capture of Embodied Agents examples featuring in PC game Hitman: Blood Money. If you would like to know more about human-like synthetic creatures used in games, read Embodied Agents in gaming - an article written by Alex J. Champandard focusing on Embodied Agents and artificial intelligence games’ projects. Another picture shows Embodied Agents and virtual animals populating real world 3D simulations and virtual worlds. These synthetic characters are capable of taking physical actions within virtual reality environments and their bodies are actually submitted to physical constraints. It is worth mentioning that the term Embodied Agent is typically used by artificial intelligence scientists and researchers focussing on developing interactive embodied agents and building multimodal human-computer interfaces. One of major challenge in designing those physically skilful Embodied Agents is to create the realistic animation of nonverbal behavior like gesture, gaze and posture shifts. The Embodied Agents Research Group (EMBOTS) affiliated with the German Research Center for Artificial Intelligence aims to develop above-mentioned modelling methods in order to create realistic animation of interactive embodied agents, including human behavior analysis, automated character animation, intelligent interactive systems and their formal evaluation. The term Embodied Agent is a composite of two words: embodied and agent. Since 1540s, the word embody has been used in reference to a soul or spirit invested with a physical form; and since 1660s in reference to principles, ideas, etc. It originates from em- “in” + body. Embodied means possessing or existing in bodily form; incarnate, bodied, corporal, corporate. The term Embodied Agent was introduced in 1997 by Andy Clark in his book Being There: Putting Brain, Body and World Together Again. Although we use chatbot as the main synonym on this website, please do not be confused. There are more than 161 synonyms in use by academics, business and embodied agent enthusiasts! It is simply a matter of reading between the lines. Please check out our main directory with 1376 live embodied agent examples (an overview as maintained by developers themselves), our vendor listing with 256 embodied agent companies and embodied agent news section with already more than 370 articles! Our research tab contains lots of papers on embodied agents, 1,166 journals on embodied agents and 390 books on embodied agents. This research section also shows which universities are active in the embodied agent field, indicates which publishers are publishing journals on humanlike conversational AI and informs about academic events on embodied agents. Also, check out our dedicated tab for awards, contest and games related to the embodied agent field, various forums like our AI forum by embodied agent enthusiasts and add any embodied agent as created by yourself and your colleagues to our embodied agent directory. Please do not forget to register to join us in these exciting times. 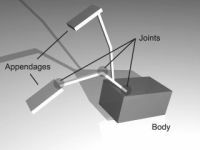 Embodied Agents may alternatively be perceived as three-dimensional objects existing within the virtual environment. The virtual environment in this case consists of a virtual world with an infinite horizontal plane that acts as the ground. Any object within this environment is acting upon by the Newtonian model of physics. As you can see on the picture, virtual creatures called Embodied Agents populate such a virtual world. Each agent has a fixed amount of time to perform its task. Upon expiration of this time period, the population of agents are evaluated and assigned a fitness score. The agent’s chances of reproduction are proportionate to fitness of its learned locomotive strategy. 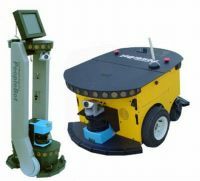 Finally, mobile robots can also serve as an alternative example of Physically Embodied Agents. They are able to move around in their environment and are not fixed to one physical location.